John Galt, the inventor who was himself only an invention of Ayn Rand's mind, rejected the existing government, economy, and society. He withdrew from the prevalent culture - physically, economically, spiritually - and developed his own alternative economy and social system in Galt's Gulch. The story itself appears to be (at best) a derivative of The Driver, by Garet Garreth, which is somewhat in conflict with Rand's stated position in favor of intellectual property rights. John Galt's Oath is instructive: "I swear by my life and my love of it, that I will never live for the sake of another man, nor ask another man to live for mine." I'm trying to imagine my relationship with Princes Charles if the Founding Fathers had felt like John Galt. First, there's the dichotomy of what a scheme professes and how it exists in the world. You could criticize Communism, and hear "the problem is with the Russian implementation of Communism, not the essence of Communism". So let's talk about professed, theoretical anarchy. What did Ayn Rand / John Galt believe? Rand believes in gold as the only true medium of exchange. In her utopia, depicted in Atlas Shrugged and symbolized by “Gault’s Gulch”, cash is worthless because there is no value in a piece of paper just because a government assigns it a value. Gold is the only medium of exchange in her paradise. When Ragner returns wealth to the producers he does not use paper, he gives Reardon bars of gold. Rand's admiration of the dollar sign as a symbol of wealth is only consistent while that dollar is worth some amount of gold. John Galt was not just a generic anarchist; he was an Anarcho-Capitalist, an anarchist who specifically rejects a monopoly economy or an imposed economy, and who rejects currency because he disputes government's legitimacy to assign value to paper scrips. Anarcho-capitalism is an anarchist philosophy that is against the idea of political government and a compulsory economy, and for voluntary, economic government through free market capitalism mediated by supply and demand. Anarcho-capitalists think that people can protect themselves without any government. Instead of stopping intrusion with laws, people could protect their own things, or agree to pay other people such as insurers, and private defenders to protect them through the marketplace. Anarcho-capitalists say that the government is a thief because it takes taxes away from people against their will, and keeps them from making unfettered agreements between themselves. (link) This is completely consistent with Rand/Galt's beliefs. "... the ethics of private property is also incompatible with the existence of a state defined as an agency that possesses a compulsory territorial monopoly of ultimate decision-making (jurisdiction) and/or the right to tax." Murray Rothbard was a preeminent 20th-century anarcho-capitalist. "I define anarchist society as one where there is no legal possibility for coercive aggression against the person or property of any individual. Anarchists oppose the State because it has its very being in such aggression, namely, the expropriation of private property through taxation, the coercive exclusion of other providers of defense service, and all of the other depredations and coercions that are built upon these two invasions of individual rights." What do Anarcho-Capitalists say about Ayn Rand? In the late 1950s, Anarchist Murray Rothbard was briefly involved with Ayn Rand. Rothbard admired Rand’s book Atlas Shrugged and even wrote to her saying so. After a few brief encounters the two had a falling out and to this day their followers continue the rivalry. Why they fell out is unknown, but rumor was that Rand gave the agnostic Rothbard an ultimatum to divorce his Presbyterian wife within six months. Rothbard did not and it is said that Rand’s group (the “collective”) held a trial in his absence and removed him from the group... Rothbard regarded Rand as psychotically running a cult and wrote The Sociology of the Ayn Rand Cult about that. He seems like a rather unlikely role model for American patriots who attend Tea Parties. Whilst your analysis of Rand's character as an Anarcho-Capitalist is valid, it should be noted that Rand herself was in favor of a government monopoly over the use of legal coercion in her later topical non-fiction. I'm not entirely sure she ever really had a distinct political opinion (it changed quite a bit throughout her life), but I doubt, at the time of writing Atlas Shrugged, at least, that she would have identified herself as an Anarchist (or an Anarcho-Capitalist). 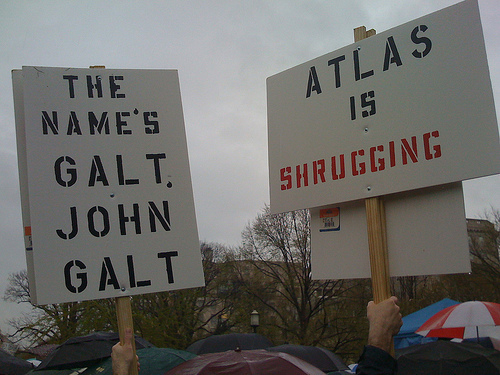 Oh, and I also find it humourous that lower-middle-class conservatives are latching onto John Galt metaphors to protest Obama's policies (which are pretty well in-line with Bush's on all but a few cosmetic items). One could say that John Galt is the out-of-the-system, unconnected super-rich who are kicking back in some Caribbean island playing finance-market arbitrage on E*Trade right now. It's definitely odd that the Tea Baggers feel more kinship with that lot than with immigrants, uninsured, or unemployed neighbors in their own neighborhood/town. 1. The federal government has no right to seize the property of any man or woman to enact social legislation (through tax codes). More particularly, the U.S. Federal Government was granted LIMITED ENUMERATED POWERS by the Constitution that do not include anything other than defense of the Nation, and the protection and support of interstate commerce. Other than the Defense Dept, almost everything the current U.S. government does is flat out ILLEGAL. 2. We (both John Galt and the Tea Bag and 9-12ers and Freedom Patriots) are enraged at the present Administration and Congress for pushing legislation to re-distribute wealth, grant unearned health benefits, and move massive amounts of American-generated wealth to outside nations who have not earned it (for the Climate Accords). Galt called them "moochers" and "looters" in 1957. We call our current government the same now. I would suggest a re-read of Atlas Shrugged by our esteemed host here, as he seems to have missed the central tenets while ascribing inaccurate interpretations (e.g. Galt as Anarchist) to Rand, Galt, and Objectivism. If you believe that the government has a right and a mandate and an ethical and moral duty to take YOUR property that YOU earned and give it to someone that did not earn it, then by all means, go move to Cuba and see for yourself how the story turns out. If you believe that every man and woman has inalienable property rights, the right to leverage their birth-given talents and skills plus their life lessons and hard work to earn as much as they wish, and further that a society that embraces this philosophy will create a living standard far above that of a wealth-redistributing society, even for the poor, low-intelligence, and handicapped (but not for the lazy, the criminal, or the moochers and looters), then stay here and fight against our new communist government. Vote all incumbents -- both parties -- out of their Congressional seats this year. Return America to what once made it great, and help us keep it from becoming the colossal exclamation point on the Cuba-E.Germany-Soviet Union experiment in allowing a government to take well-earned property from those who earned it. "I'm trying to imagine my relationship with Princes Charles if the Founding Fathers had felt like John Galt." Given the tenor of your question, my guess is you'd be sleeping with him.